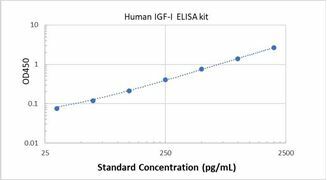 Specificity This assay has high sensitivity and excellent specificity for Human IGF-I. No significant cross-reactivity or Human IGF-I and analogues was observed. 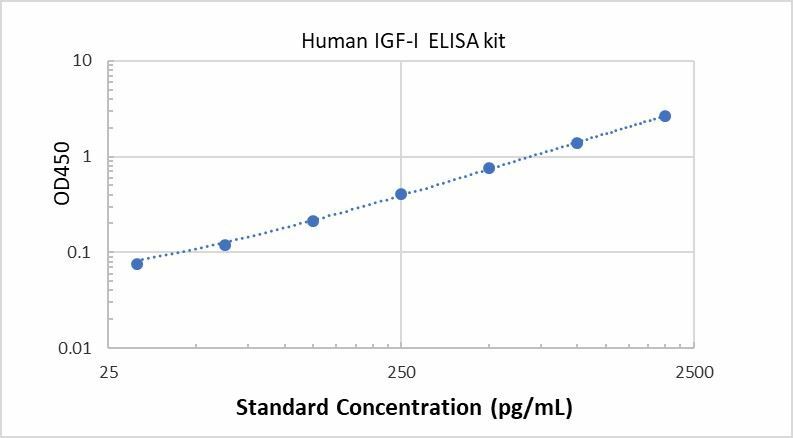 Typical Data ELISA: Human IGF-I ELISA Kit (Colorimetric) These standard curves are provided for demonstration only. A standard curve should be generated for each set of samples assayed. Background Insulin-like growth factor 1 (IGF-1), also called somatomedin C, is a protein that in humans is encoded by the IGF1 gene.IGF-1 has also been referred to as a "sulfation factor" and its effects were termed "nonsuppressible insulin-like activity" (NSILA) in the 1970s. IGF-1 is a hormone similar in molecular structure to insulin. It plays an important role in childhood growth and continues to have anabolic effects in adults. A synthetic analog of IGF-1, mecasermin, is used for the treatment of growth failure. IGF-1 consists of 70 amino acids in a single chain with three intramolecular disulfide bridges. IGF-1 has a molecular weight of 7,649 Daltons.